Charming, silly and entertaining, The Gondoliers is undeniably Gilbert and Sullivan, but it’s also one of its creators’ sweetest operettas. It only glimpses into the world of topsy-turvy – the nonsensical world in which logic was set against itself to cause sorrow among the young, only to be resolved and lifted into joy with the same backwards logic. Topsy-turvy was the world that earmarked the Victorian sensibility of the author and composer and assured their success and their endurance over time. In The Gondoliers absurd illogic is at a minimum, and darkness barely raises its heavy and malign head. There are no bad guys, except for the Grand Inquisitor, and even he is more doleful than dreadful. His role is as an instrument of the plot rather than as a malevolent force. The rest is like a dream of Italy, warm and sunny and full of song. Michael Desnoyers as Marco Palmieri and Samuel Rabinowitz as his brother Giuseppe in the Lamplighters production of Gilbert and Sullivan’s “The Gondoliers.” Photo by David Allen. The Lamplighters brings all their sunlit talent to the production, with accomplished singers; an orchestra, under the baton of Baker Peeples, well versed in the composer’s hectic merriment; vivid sets (Peter Crompton) and costuming (Judy Jackson and Miriam Lewis) and a generous joy in giving over to the daftness at hand, the staging deftly directed by Phil Lowery. The production opened Friday at Yerba Buena Center for the Arts and will be touring the Bay Area through February 18, with stops in Walnut Creek and Mountain View. The play’s backstory tells of an infant prince who is spirited away from the island kingdom of Barataria for reasons of political safety, and given to a Venetian gondolier to raise incognito with his own son. Spirited away but not before being married to the infant daughter of the daffy Duke of Plaza-Toro (F. Lawrence Ewing) and his sensible Duchess (Cary Ann Rosko). When the play opens in Venice, the two gondolier brothers Marco and Giuseppe Palmieri (Michael Desnoyers and Samuel Rabinowitz), now come of age and all the rage among the contadinas, are about to choose their brides. In order to be fair about it, they decide to choose blindfolded. This seems to work because they manage to capture the girls they most fancied, Tessa (Whitney Steele) and Gianetta (Amy Foote). Not long after the chorus of gondoliers and contadinas disappear to prepare for the weddings, the Duke and Duchess arrive with their lovely now-20-year-old daughter, Casilda (Patricia Westley). Casilda is secretly in love with the Duke’s attendant, Luiz (Patrick Hagen). Oh, shock and disappointment when Casilda learns she is already married to the heir of the throne of Barataria! Further that the King of Barataria and the entire warring aristocracy have been killed in an insurrection. They have come to Venice to find the new king, Casilda’s husband, and Casilda will soon be a queen, far outside the reach of her gentle Luiz. Funny thing that. The prince’s guardian is dead and no one seems to remember which of the gondolier’s sons is the King and which is a simple gondolier … except … perhaps … the princeling’s nursemaid (Judith Dara Epstein). And where is she? In the far away mountains (somewhere). Luiz is sent off to find the nursemaid, and Marco and Giuseppe are sent to Barataria in order to rule in tandem until the identity of the real king is revealed. Well, no spoilers here. How the knot is untangled is best delightfully discovered at the theater…. 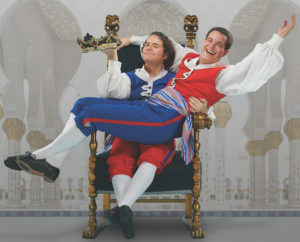 The next performances of The Gondoliers are at the Lesher Center for the Arts in Walnut Creek, February 9–11. For tickets and information, visit lamplighters.org.